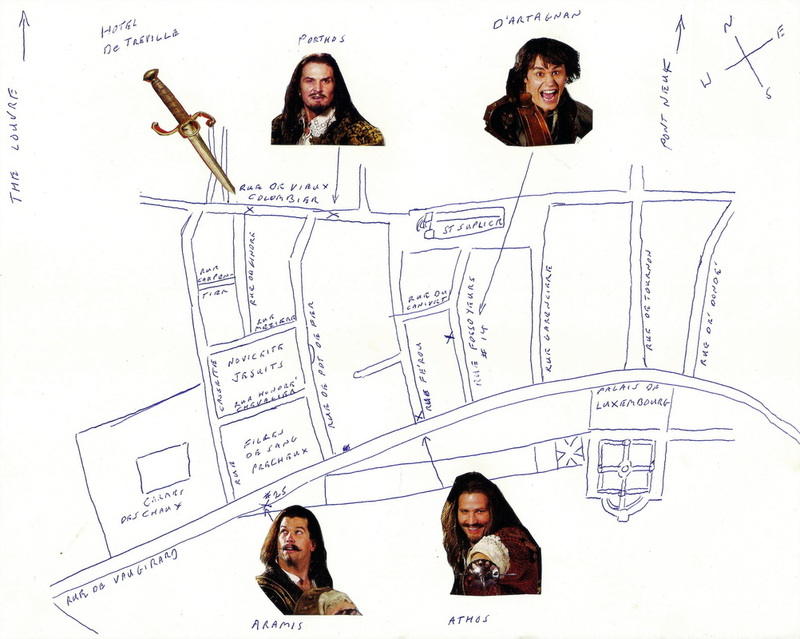 In the novel, D'Artagnan is pleasantly surprized to discover that his lodgings on Rue des Fossoyeurs are close to the Hotel de Treville and all of his friends! How convenient! I've drawn up a map of the neighbourhood, but you can look at the larger google map here. Scroll down to read about these locations and view the videos. Checking out the distance from D'Artagnan's place to Athos'. The Hotel de Treville on Rue du Vieux Columbier, headquarters of the King’s Musketeers – where D’Artagnan meets his friends to be (Athos, Porthos and Aramis) for the first time. The exact location is not mentioned, but it is a very short street. [#2 on the map] Note: we have since found out that there was an actual Musketeer Headquarters located at 15 Rue du Bac, just south of Pont Royale. This is visible on the Turgot Map. In Chapter 5 of the book Athos and Porthos enjoy a tennis match here by the stables (the exact location of which I couldn’t find – perhaps you can?) while D’Artagnan and a wounded Athos watch. Also watching are some of the Cardinal’s Men, one of which (Bernajoux) wants to fight D’Artagnan to avenge the wounded Jussac. They fight and Bernajoux is seriously wounded. The scene escalates into a full on melee spilling out on the street Vaugirard and into Rue Ferou. Aramis and his man Bazin are at 25 Rue Vaugirard – just down the street from the Luxembourg. [#4 on the map] This is also where D’Artagnan sees Constance exchanging handkerchiefs with another woman, after which he escorts her to her rendezvous on the Rue de la Harpe.